“The drone industry is poised to be one of the fastest-growing sectors in the U.S.,” according to AUVSI CEO, Brian Wynne. A growing variety of industries are planning to take advantage of the lightweight, unmanned aircraft and have already begun to utilize (or actively advocate) UAS technology, which has created thousands of jobs and innovations in technology and business. Certain industries are taking off more rapidly than others and are shaping up to deliver real-world benefits with the widespread adoption of UAS. Even with restrictive Federal Aviation Administration (FAA) guidelines, many industries are able to reap the benefits of the nimble flight. Fortunately, operational Intelligence (OI) technology can be the connection the FAA needs to help ensure the safety of our national airspace due to its ability to provide unprecedented data insight. With that technology in UAS’ corner, the sky’s the limit for these six industries poised to take off with UAS adoption. Agricultural drones are changing the way we farm and might soon be regularly flying over America’s farmlands. In fact, some already are. Even with our modern machinery, soil-testing, computers and ground-based sensors, which have made crop monitoring and tending more efficient, some critical agriculture issues continue to go unnoticed. Precision agriculture incorporates geospatial data and sensors to micro-target fields for better growth. Spectral imaging with drones will garner data-driven insights, allowing for more targeted fertilizing and better use of water and labor. UAS can also be used to spray pesticides and monitor and treat crops. Monitoring for disease and drought could be made much easier with the use of drones, as well. 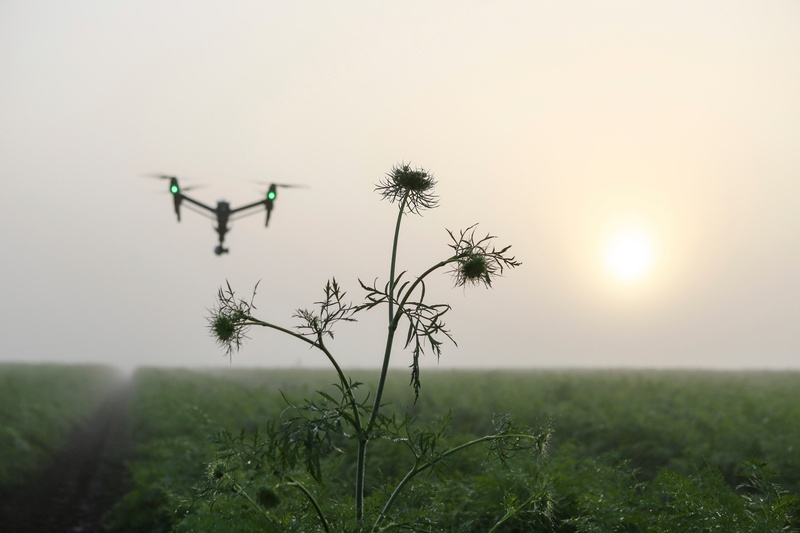 Farmers are very interested in using UAS imaging systems to improve crop surveillance, which enables them to more easily identify and correct issues early to increase farm crop yields and their ROIs. This industry encompasses aerial photography for reporting, entertainment and commercial purposes. There is a growing cohort of journalists using unmanned aircraft for reporting. Drones for photography and film footage of large-scale events, particularly interests the news media. Sporting events are another good example; drones were recently used to give audiences unique views during the Sochi, Russia Olympics. Hollywood has also been starry-eyed about using drones to replace expensive helicopter-mounted aerial cameras. Filmmakers and TV stations have long relied on helicopters for their most dramatic footage, but they’ve been eager to employ drones to help lower the cost of having eyes in the sky, but more importantly, to get more high-impact shots than ever before possible. Many memorable scenes in the recent Oscar award-winning James Bond film, for instance, were filmed with drones. An increasing number of filmmakers are hoping to make use of drones to give audiences a new and thrilling experience. As the technology has improved and moved beyond military applications, drones have been tasked to carry and deliver goods ranging from medical supplies to mail packages to pizzas. They’ve already begun to do this with publicity-grabbing deliveries by Amazon Prime Air and the drone delivery start-up company, Flirtey, which conducted the first successful drone delivery in a U.S. urban setting approved by the FAA. Corporate giants like Walmart and Google also believe that drone delivery is the future and the next iteration of consumer retail technology while they develop their own drone delivery methods. Other companies are working to employ drones in order to deliver medicines and humanitarian aid supplies to hazardous areas. Many believe this to be a regularly occurring process in the not-so-distant future. Commercial and residential real estate brokers are seeing the competitive advantages of using drones to grow their businesses. New ways to market properties are soon to have a dramatic increase. Brokers have already begun testing their house-hunter appeal by using drones to take aerial photos and footage of properties, even at low altitudes. Offering different perspectives to potential buyers can enhance the marketability of their properties. Drone aerial photography offers brokers a new means to show off properties, especially ones on large estates, and is transforming the way home buyers will shop for real estate. Mapmaking and surveying have been revolutionized by technologies such as GPS and laser scanning. UAS technology provides another step forward. The drones collect imagery that can be marked with precise GPS-derived locations, creating nearly instant maps of areas that might be difficult or even dangerous to traverse. Energy firms, mining companies and developers, among others, benefit from detailed aerial mapping in areas where they plan to dig or build. UAS can also help with surveying and mapping earthquakes, landslides, plane crashes, excavation sites, forest surveying – the list goes on. Compared to traditional aircraft, operating UAS to carry out such mapping tasks is much easier and more efficient. The utility industry has seen a surge of excitement over the use of drones recently. UAS is generating a lot of interest amongst utility companies and power authorities across the U.S. that regularly inspect hard-to-reach equipment. They are turning to drones to inspect power lines, gas lines, railroads and highways. Until recently, methods of surveying, detecting and locating leaks and repair issues had been inefficient and costly to conduct. The use of drones could help cut costs significantly and improve worker safety, especially in remote areas. Drones could help reduce the cost of carrying out such inspections and allow safe 3D mapping of drill sites, gas pipelines, landfills and other municipal operations. Drone functions like imagery, mapping and LIDAR, a surveying technology that uses a laser light to measure distances, could help improve the difficult inspection of hard-to-reach areas. Sensors are also being developed to improve upon safety and use of resources. Methane sensors, for example, can be used to detect and measure methane gas leaks and reduce methane emissions. Major innovations in UAS technology are at hand, thanks to rapidly evolving industries. Drones are being used across industries as a more efficient and cost-effective option. However, the reason that more of these industries aren’t as quick to get drones into the skies is that getting permission to use them is not currently an easy process due to current FAA regulations. It is likely, though, that this is soon to change, especially with the help of OI technology. OI has proven that drones can be safely integrated into the national airspace. OI can provide the visibility and insight into data that will help ensure safety in the U.S. airspace while more and more drones are entering our skies for various purposes and industries. It accomplishes this by providing a single and complete operational overview of post workflow data, which provides deep analytics, real-time processing, insight and intelligence that enable better-informed decision making. OI will help grow these industries and shorten the time-to-market for other new UAS products.